Nothing warms the tummy or the soul like the rich burn of Scotch whiskey. Pricey? Yep, but not on Sundays. Sip a smooth one for free -- and we're talking the good stuff. It's the rarest and most interesting Scotch in the world, and it's off-limits to whiskey enthusiasts. A crate of Scotch that was left by famed explorer Sir Ernest Shackleton in the Antarctic, where it became buried in ice over the last century was finally opened Friday. The crate, found under Shackleton's hut in 2006, was excavated and taken to New Zealand, were it has been thawed very slowly in recent weeks at the Canterbury Museum on South Island. Inside, the alcohol archaeologists found 11 bottles of Mackinlay's Scotch whisky, wrapped in paper and straw to protect them from the rigors of a rough trip to Antarctica for Shackleton's 1907 Nimrod expedition. Though the crate was frozen solid when it was dug out of the ice, the booze never froze under the 20-below temperatures and is described as being in remarkably good condition. 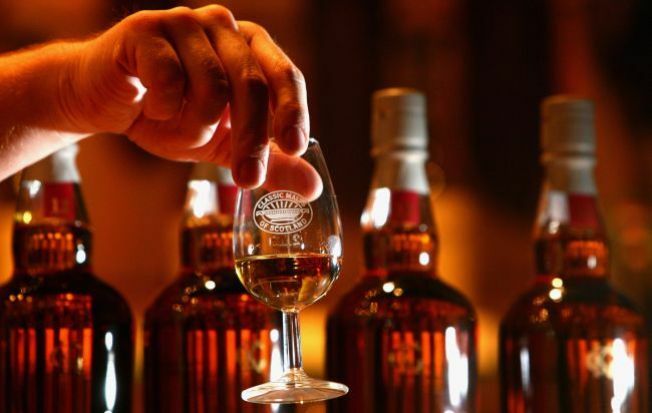 This Scotch is unlikely ever to be tasted, but master blenders will examine samples taken by syringes through the cork to see if they can replicate the brew. The original recipe for the Scotch no longer exists. Once samples have been extracted and sent to Scottish distiller Whyte and Mackay, which took over Mackinlay's distillery many years ago, the 11 bottles will be returned to their home — under the floorboards of Shackleton's hut at Cape Royds on Ross Island, near Antarctica's McMurdo Sound. Selected Reading: The Associated Press, NPR , NEWSscotsman.com.